STILLWATER, Okla. – The No. 2 seed Arkansas Razorbacks (38-22) earned a 4-3 win over No. 4 seed St. John’s (41-16) to sweep the Stillwater Regional and advance to the Super Regional round of the NCAA Tournament. The Razorbacks will take on Missouri State next weekend. The NCAA will announce Super Regional locations, dates, times and television information on Monday night. With the game tied 3-3 in the top of the ninth inning, the Razorbacks manufactured a run to take the lead and the Stillwater Regional title. Brett McAfee got the rally started with his third hit of the night and Michael Bernal followed with a single. With the bases loaded and one down, Joe Serrano hit a chopper to the left side that scored McAfee to make it a 4-3 game. Zach Jackson came out of the bullpen in the bottom of the ninth and struck out the side to earn his second save of the weekend and send Arkansas to Super Regionals. Jackson Lowery, starting just the third game of his career, retired the first 11 hitters and tied his career high with five-plus innings pitched. The right-hander allowed just one hit, one run and struck out three in the no-decision. McAfee and Bernal also began the Razorback rally in the fifth when the duo led off the frame with singles. Tucker Pennell and Joe Serrano both drove in runs to give Arkansas an early 2-0 lead. The NCAA Regional title is Arkansas’ fourth in the past seven years and its sixth Super Regional appearance since the format began in 1999. The Razorbacks last won an NCAA Regional in 2012 when Arkansas went on to win the Waco Super Regional and advance to the College World Series. Serrano earned the regional’s Most Outstanding Player award after batting .500 (6-for-12) with a double, two runs scored and two RBIs, including the game-winning RBI against St. John’s. Five other Razorbacks were named to the Stillwater Regional All-Tournament Team: Michael Bernal, Tyler Spoon, Andrew Benintendi, Jackson Lowery and Zach Jackson. 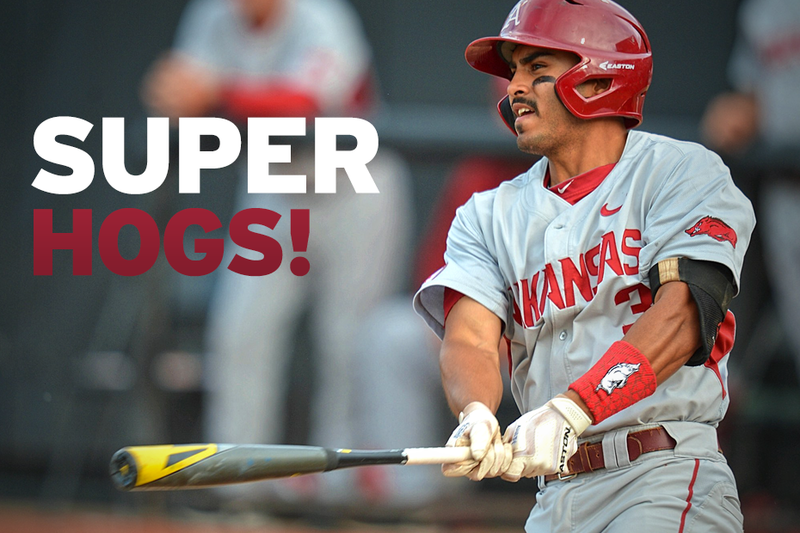 • Arkansas advances to its fourth Super Regional in the last seven years. • The Razorbacks have swept their regional for the fourth time in eight years. • Arkansas improves to 69-58 all-time in the NCAA Tournament and 51-39 in NCAA Regional action. • The Razorbacks are in the midst of their 28th NCAA Tournament in program history, including the 14th consecutive. • Arkansas has won two Super Regionals in the last seven years, advancing to the College World Series in 2009 and 2012. • The Razorbacks have won 13 of their past 17 games away from home. • Michael Bernal extended his career-long hitting streak to 13 games with his 10th multi-hit game. • Joe Serrano delivered his 17th multi-hit game and a team-high 64th of his career. • Tyler Spoon added his 20th multi-hit game, 20th double and sixth home run of the season. • Brett McAfee had his third three-hit game of the year. • Zach Jackson claimed his eighth save and second in as many games. • Jackson struck out 10 of the 12 batters he retired in the Stillwater Regional. The NCAA will not award hosting sites or announce dates for the Super Regionals until late Monday evening (approximately 10 p.m. Central). The Arkansas Razorbacks have put in a bid to host Super Regionals at Baum Stadium and are hopeful to be selected. On Monday from 8:30 a.m. to 1 p.m. Central, season ticket holders and Razorback Foundation members will be able to request Super Regional tickets through their online account. If the Razorbacks are awarded a Super Regional on Monday evening, the Razorback Ticket Center will be prepared to make all-session tickets available to the public on Tuesday morning. All-session passes, which include tickets to all games of the best-of-three Super Regional will be $35 and will be available for purchase on ArkansasRazorbacks.com and at the Razorback Ticket Center at Baum Stadium. Single-game tickets will be $15, but will not be sold until gameday and only if seats remain. Due to NCAA ticket polices, we will be unable to provide complimentary tickets for University of Arkansas students. For more information on Arkansas baseball, follow @RazorbackBSB on Twitter.